The early solution to the problems of distribution of fresh milk was to process it. The process were making milk safer and ending the dreadful sequence of nineteenth century urban epidemics associated with tainted milk. Because milk consists mostly of water with lactose accounting for only about 5 percent of its weight and fat and protein 4 percent each - it can be substantially reduce by boiling at a low temperature in a vacuum. The thick liquid resulting from this process can be sterilized to make evaporated milk or mixed with sugar to make condensed milk. There was a British patent for ‘condensation’ as early as 1835, but the American, Gail Borden who concentrated milk by evaporation in a vacuum and then sold the product from open vessel like ordinary milk, was the true pioneer; he also produced a canned condensed milk which preserved by the inclusion of sugar. Gail Borden had been a teacher, land surveyor, inventor, real estate salesman and editor. He went into invention the canning of condensed milk. He patented condensed milk in 1856. In fall 1861, the Commissary Department order the first 500 pounds of condensed milk from New York Condensed Milk Company for the Union Army. 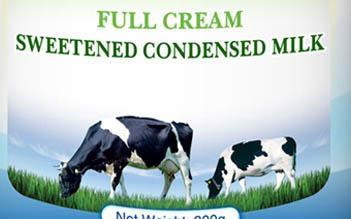 By 1899 twenty-four condenseries were manufacturing condensed and evaporated milk countrywide. In Europe, tinned milk consumption increased rapidly after the establishment of the Anglo Swiss Condensed Milk Company in 1865 and an export trade emerged almost immediately. By 1890 price had fallen enough to make it appeal to poorer. It became increasingly popular in the last quarter of the nineteenth century. Some was produced in Britain, but a rising proportion was imported. Sweetened condensed milk was cheaper than fresh milk if diluted to the same consistency, and of also kept longer, an important matter in houses with no cool larders.